Fortuitously, it is also time to update the guidelines that I provide the JAH Digital History Project Reviewers (copied below). Having just had a number of conversations about peer review of digital projects at the RRCHNM conference, I know that I want to push reviewers to think more about who the various contributors are (including undergraduate and graduate students), to contemplate questions of coding/programming, and to look more deeply at claimed and actual historiographic impact. I’m also struggling with notions of reviewing versions of digital projects (should we go back a review a site again after a big update?) as well as questions of how to capture the complexity of some projects in limited space (is it worth doing just 3 1000-word reviews to allow reviewers to explore more extensively each site?). So, any suggestions you have for changes, updates, clarifications, or additions are welcomed. “Web Site Reviews” first appeared in the June 2001 issue of the Journal of American History and became “Digital History Reviews” in the September 2013 issue. 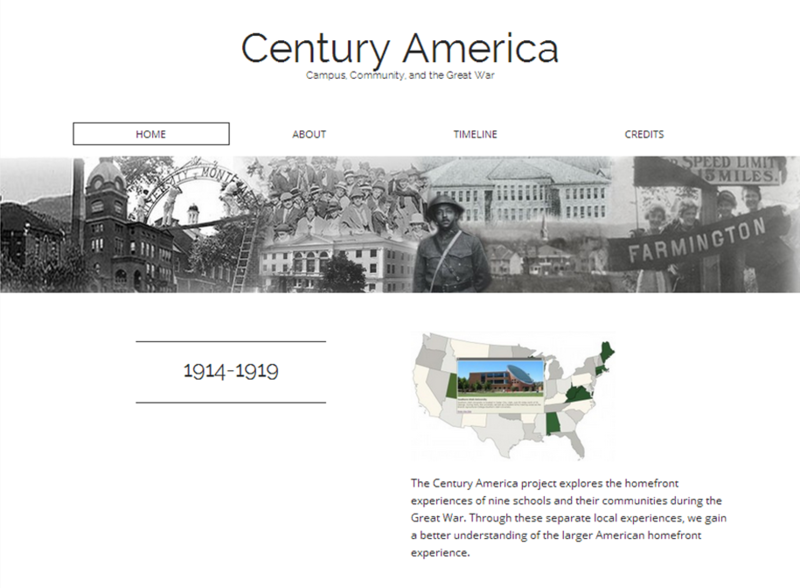 This section is a collaborative venture with the Web site History Matters: The U.S. Survey Course on the Web http://historymatters.gmu.edu. This section appears quarterly and normally runs five reviews. Jeffrey W. McClurken, the department chair and professor of History and American Studies at the University of Mary Washington, is the contributing editor for the “Digital History Reviews” section of the Journal. The editor welcomes suggestions and may be reached at jmcclurk@umw.edu. Although these scholarly reviews of digital history projects follow the long tradition of reviewing books in theJAH—as well as the more recent practice of reviewing museum exhibitions, films, and textbooks—digital history reviews have some particular features. The guidelines below provide specific suggestions for dealing with this medium. Please feel free to write to me with any questions you might have, as well as suggested revisions and clarifications in the guidelines. Archive: a site that provides a body of primary documents. Electronic Essay/Exhibit: something created/written specifically for the Web—that is, a secondary source that interprets the past in some fashion. This would include “hypertexts” that offer a historical narrative or argument. Teaching Resource: a site that provides online assignments, syllabi, and other resources specifically geared toward using the Web for teaching. Tool: something that provides functionality related to creating, accessing, or editing digital history content (rather than the content itself). Gateway: a site that provides access to other Web-based materials. Organization: a site devoted to providing information on a particular organization. Virtual Community: a site on which a historical community—popular or academic—interacts. Most projects to be reviewed will probably fall into one of the first three categories. The reviewing criteria will vary depending on the category into which the site falls. Thus, for example, an archival site should be evaluated based on the quality of the materials presented; the care with which they have been prepared and perhaps edited and introduced; the ease of navigation; and its usefulness to teachers, students, and scholars. How comprehensive is the archive? Are there biases in what has been included or excluded? Does the archive, in effect, offer a point of view or interpretation? As with other types of reviews, you are providing guidance to readers on the usefulness of the site in their teaching or scholarship. At the same time, you are participating in a community of critical discourse and you are trying to improve the level of work in the field. As you would do in a scholarly book review, then, you are speaking both to potential readers and to producers of similar work. Even within a single category, the purposes of the digital history projects can vary significantly. An online exhibition or an “electronic essay” can be directed at a largely scholarly audience or a more broadly public audience. It would be unfair to fault a popularly oriented Web site for failing to trace the latest nuances in scholarship, but it would certainly be fair to note that the creators had not taken current scholarship into account. In general, then, online exhibitions and essays should be judged by the quality of their interpretation: What version of the past is presented? Is it grounded in historical scholarship? Is it original in its interpretation or mode of presentation? Again, the goal of the review is to provide guidance to potential readers (who might be reading in their roles as teachers, scholars, or citizens) and to raise the level of digital-based historical work. Classroom-oriented projects would be judged by the quality of the scholarship underlying them, but naturally you would also want to evaluate the originality and usefulness of the pedagogical approach. Will this project be useful to teachers and students? At what level? Reviews of digital history projects must necessarily address questions of navigation and presentation. To some extent, this is the same as a book reviewer commenting on whether a book is well written or clearly organized. To be sure, the conventions of book publication are well enough established that book reviewers rarely comment on matters of navigation or design—although they do occasionally note a poorly prepared index or a work with excessive typographical errors. But in the digital world, which is an emerging medium that is visual (and often multimedia), issues of design and “interface” are necessarily more important. In this sense, digital history reviews share a great deal with film and exhibit reviews. In general, reviewers should consider what, if anything, the electronic medium adds to the historical work being presented. Does the digital format allow the creators of the project to do something different or better than what has been done in pre-digital formats (for example, books, films, museum exhibitions)? Have the creators of the project made effective use of the medium? How easy is it to find specific materials and to find your way around the project? Content: Is the scholarship sound and current? What is the interpretation or point of view? Form: Is it clear? Easy to navigate? Does it function effectively? Does it have a clear, effective, and original design? Does it have a coherent structure? Audience/Use: Is it directed at a clear audience? Will it serve the needs of that audience? New Media: Does it make effective use of new media and new technology? Does it do something that could not be done in other media—print, exhibition, film? Because some digital history projects (largely archives) are vast, it is not possible to read every document or visit every link. American Life Histories: Manuscripts from the Federal Writers’ Project, 1936–1940, at the Library of Congress’s American Memory site, http://memory.loc.gov/ammem/wpaintro/wpahome.html, includes 2,900 documents that range from 2,000 to 15,000 words in length. The reviewer could hardly be expected to read what probably amounts to the equivalent of 300 books. In such circumstances, some systematic sampling of the contents can substitute for a review of every single Web page. At the same time, the reviewer of a Web site should devote the same kind of close attention to the work as does a reviewer of a book, exhibition, or film. Because there is no easy way to indicate the size of a Web site (as you can note the number of pages in a book or the number of minutes in a film), you should try (ideally early in your review) to give readers some sense of the kinds of material found and the quantity of each. One final way that digital history projects differ from books, exhibits, and films is that they are often works in progress. Thus, we ask that the headnote for the review indicate when you examined the project (this could be a range of dates) just as you would indicate in reviewing a performance of a play. Where the project plans some significant further changes, you should say that in the review. If you think that it would make more sense to wait for further changes before reviewing the project, then please let us know and we will put the review off to a later date. If you feel that you need additional information about a project in order to complete a review, we would be happy to contact the author or creator on your behalf. Because of our scholarly and pedagogical focus, our first priority in selecting reviewers is to find people whose scholarship and teaching parallels the subject areas of the project. We do not favor people who have some “technical” skill any more than we would expect book reviewers to know how books are typeset and printed. But we do have a preference—where possible—for reviewers who are familiar with what has been done in the digital world, since that will give them a comparative context for their evaluation. Still, we recognize that such familiarity is still only gradually emerging among professional historians, and some reviewers will be relatively new to such work. Name of site/title. Address/URL. Who set it up? Who maintains it (if different)? When reviewer consulted it. Panoramic Maps, 1847–1929, http://memory.loc.gov/ammem/pmhtml/panhome.html. Created and maintained by the Geography and Map Division, Library of Congress, Washington, D.C. Reviewed Dec. 25, 2000–Jan. 2, 2001. The Triangle Shirtwaist Factory Fire: March 25, 1911, http://www.ilr.cornell.edu/trianglefire. Kheel Center for Labor-Management Documentation and Archives at Cornell University in cooperation with unite! (Union of Needle Trades, Industrial, and Textile Employees); edited by Hope Nisly and Patricia Sione. Last site update April 21, 2000. Reviewed Dec. 20, 2000–Jan. 5, 2001. So, 8 weeks after the ITCC opened, I decided it was (past) time for an update to students, faculty, and staff about what was going on in the building and was still to come. This is the email that went out to Faculty and Staff. Starting today the multimedia editing room with vocal recording booth opens on the first floor (accessible to all students via the EagleOne card). In the weeks and months to come, the building will offer new opportunities, from checking out digital equipment at the Information Desk, to the opening of an Advanced Media Production Studio and the Digital Auditorium, to the unveiling of the Library’s Digital Archiving Lab and Digital Gallery on the third floor near the bridge. Keep an eye as well on the Digital Media Wall in the lobby of the ITCC as we begin to display more student-created digital media projects. If you have any questions about the Convergence Center’s resources, policies, hours, options, and opportunities for students, faculty, and staff, or simply want to keep up to date on what’s new in the building, check out the newly launched website, http://convergence.umw.edu. You can also ask any of the student aides who work in the building about what is here and how to use it, especially those staffing the Information Desk found as you enter the building from Campus Walk. I haven’t written much about my new job as Special Assistant to the Provost for Teaching, Technology, and Innovation (SAPTTI), in part because it has kept me quite busy, especially since it is “only” a half-time position (meaning I’m still teaching two courses each semester). But today I had a day that involved many of the aspects of this new position that I deeply enjoy, and I wanted to share them, both for my own sake, and for others to get a sense of what a position like this one entails. Collaboratively planning a new First-Year Seminar–“Beyond the Selfie: Exploring Digital Identities”–with an amazing team of faculty and staff from multiple disciplines to be taught in the Fall of 2015. Sitting a shift at the Convergence Center Information Desk where I saw over a hundred students, faculty, and alums (it’s Homecoming Weekend) walk in to go to class, to hang out in the chairs, to study (on a Friday!) in the collaboration spaces, to meet with people from the Help Desk, Writing Center, Speaking Center, Center for Teaching Excellence & Innovation, and just to check out the building. Reviewing with the ITCC building contractor and UMW’s project inspector the myriad of small things that continue to be revised in any new building. Finishing up one of the last duties of my life as department chair, a duty that reinforced for me how great the faculty are in my home Department of History and American Studies; they are a gifted group of scholar-teachers. Swapping strategies on framing a proposal a number of people from various departments have been working on for a new major in Communication and Digital Studies. Writing up an email to UMW students about the resources currently available in the Convergence Center, the new ones coming on line (including our Multimedia Editing Lab) and the features still to come, like our Digital Auditorium and Production Studio. Working to finish up the process of adding an important final piece to the people who make the ITCC go, a part-time Building and Digital Auditorium Manager. Reviewing questions for a survey of students to assess their interest in digitally enabled learning of all forms, their digital fluency, and their experiences using technology in learning. [A survey built and to be run, in part, by UMW students.] This survey results will be a key set of data as I work with others on a digital learning strategy for UMW this year. At so many points today I was surrounded by smart, thoughtful, creative, gifted people, all teachers and learners (despite their titles of student, faculty, staff, administrator, director, or whatever). Laughter abounded, ideas blossomed, learning happened. What is the day in the life of a Special Assistant? Well, this one was pretty good, but frankly, on the whole, most of them are. Let’s get something clear from the start: I love teaching. I love teaching history. I love teaching students at a school that prioritizes teaching. I love walking in to a classroom with historical documents and scholarly readings and images and strategies for how I’m going to talk with students about the past (and often the present and the future). I love that I walk out from that same classroom an hour or so later simultaneously exhausted and exhilarated, having learned as much as the students have in our give and take of learning about the past. I love seeing what students can do if you push them out of their comfort zone while also providing them with support and opportunities to approach, both creatively and rigorously, the study of history. I love my job. My approach to teaching is grounded in the importance of historical inquiry, the multidisciplinary nature of the liberal arts, and five key related beliefs. First, I believe that students are at the center of teaching. I work to involve students in classes as participants, leaders, and fellow learners. In exchange, I expect students to take responsibility for their education in and out of my classes. Second, I believe that technology can play a key role in enhancing traditional pedagogical practices. I integrate WordPress, Omeka, Facebook, Twitter, wikis, and web-based discussions, online research, multimedia content, digital history projects, electronic editing of papers, and image and video creation into my classes. All of these aspects of technology are used to vary and improve communication, offer alternative forms of discussion or presentation, or broaden the academic experience in and out of the classroom, while holding on to scholarly and intellectual rigor. Third, I believe in the importance of teaching students to be critical consumers of knowledge. I have a responsibility to teach students to approach all primary and secondary content with a skeptical eye, not just historical sources or scholarly books and articles, though grappling with these remain essential to the discipline. For example, in my courses on US History in Film, American Technology and Culture, Civil War and Memory, History of the Information Age, and Digital History, I work with students to analyze critically what have become the key popular sources of information about the past, namely movies and the Internet. In all my classes I work with students to explore what it means to be skeptical about all sources of knowledge. Fourth, I believe in the need to teach students to be rigorous yet creative and adaptable producers of knowledge. This skill links closely with the previous notion. Understanding how knowledge is produced makes one a better consumer, but being skeptical about one’s sources also makes one a better writer and speaker. In my classes students are encouraged to express themselves in various ways: formal and informal, written and oral, online and in person. I teach a number of different skill sets related to exchanging and expressing information in my classes, from basic writing to oral presentations to working with groups to digital project design to the creation of infographics, images & documentaries, yet all stem from one’s ability to convey content, concepts and ideas in the best possible way. Fifth, I believe in students being “uncomfortable, but not paralyzed” in their learning. A student walked into my office several years ago and said to me, “Dr. McClurken, I’m really struggling with all this online stuff,” referring to the projects I had assigned to the students in my American Technology and Culture course. She explained that digital projects were unfamiliar to her and that she was uncomfortable with her ability to do the assignment. She was surprised when my response to her discomfort was, “Good.” I went on to explain that I wanted her and her classmates to push the boundaries of what they understood about the conceptualization and presentation of historical information beyond papers and tests. Though she struggled a bit learning the tools we were using that semester, she later sent an email thanking me for introducing her to new methods of approaching history with the subject heading, “From Antipathy to Appreciation.” Note the last part of my initial phrase—“not paralyzed”—because it’s equally important. I want students to move out of their comfort zones because that is where deep learning occurs, but I don’t want them to be so uncomfortable they can’t get anything done. To keep them from paralysis we discuss potential resources to which they can turn (including their fellow students), we talk extensively about what constitutes successful work (even to the point in some classes of collectively constructing the rubrics with which I assess their papers and projects), and I tell them that they can always come to me if truly stumped. The results of a semester’s worth of student discomfort is worth it to me, and more importantly to them, as I see their pride in the work that they’ve created and shared not only with me or with their class, but with the wider world. This post is part of a Connected Courses assignment, and is a revised version of a piece I’ve written in various forms for various submissions. My brief remarks are posted below. Let me offer my own welcome to all of you and my thanks for coming this afternoon. I want to start by offering some much-needed “thank yous” to people involved in this project. Thank you to my fellow ITCC Building Committee members for all their efforts in dreaming up a new space in which people could work. Thank you to the architects and designers at HEWV for turning that dream into a vision. Thank you to UMW’s Len Shelton and Joey Straughan and W.M. Jordan’s Frank Bliley for their efforts in making sure that the vision became a reality. Thank you to Provost Jonathan Levin and Vice President Rick Pearce for stepping up with the resources necessary to operate the building. Thank you to the new residents of the building for working with each other to ensure the space becomes all it can be. Thank you most of all to John Morello, for shepherding this project from conception to creation. It is not a stretch to say this building would not be here today were it not for his leadership. Let’s give him a well-deserved round of applause. Now I haven’t ever sat in President Hurley’s chair, but it seems clear to me that this Convergence Center addresses both of these goals. The first is perhaps obvious to anyone who has walked around it. [And if you haven’t, please take advantage of the tours that will be offered after this ceremony.] Simply put, the opportunities for transformational experiences for students exist throughout the space. Less obvious is how constructing a building contributes to (rather than subtracts from) an institution’s resources. And the answer to that is that it is buildings like these that bring in new students, buildings like these that inspire faculty, buildings like these that engage staff, and buildings like these that attract donors. The Convergence Center introduces the UMW community to a wide array of technologies and opportunities that simply haven’t existed before, and in a format that doesn’t exist at other schools. Now, much has been made in the press in recent years of the potential for technology to alienate people from each other. This technology-rich building contradicts that claim. With its classrooms and collaboration spaces, with its communal furniture and its multiple centers of student support, with its formal and informal gathering spaces, this building is a physical manifestation of the institution’s emphasis on–no, the centrality of–the relationship between people: faculty and student and staff — the relationship between teachers and learners, mentors and mentees. Yes, it is a technology-enabled building that supports our digital spaces, but it does so to further enable the personal connections that are at the center of knowledge creation and at the core of the deeply collaborative experience of learning. It is also a manifestation of UMW’s leadership in the field of digitally enabled creativity. It is an institutional commitment to the future of teaching and learning, a future in which we see even more than before the melding (a convergence) of the curricular and co-curricular in one space. This building represents the future of UMW while maintaining the commitment to students, to individual and group exploration, and to a variety of learning techniques. The building itself, with so much glass, surrounding Campus Walk itself, is also an acknowledgment of our responsibility as a state institution of higher learning to be outward facing, to be transparent in what we do and what we have to contribute to the region, the nation, and the world. So, to students, faculty, and staff of the University of Mary Washington: welcome to your new home on campus. Looking forward to joining the Connected Courses discussion over the next few weeks. In any case, I’m excited to join in on these discussions. I’m teaching my History of the Information Age course again this fall. This is the course where I send the students a skeleton syllabus and we fill it in together. We will work together to pick the topics to focus on, many of the readings to complete, and the digitally rich assignments by which we will explore the history of broadly defined Information Age (cave paintings to today). We will also get to do so in the soon-to-be completed Information and Technology Convergence Center‘s Active-Learning Classroom. We also will be able to take advantage of the building’s green-screen-equipped recording studio, the audio booth, the editing computer stations, and the other cameras and recording equipment that can be checked out and used. I’d welcome any suggestions of assignment ideas, discussion starters, readings/videos that I can bring to the class. Other comments, including smart remarks, are welcome as well. This readings seminar will explore the history of communication, media, new media, and the digital age. We will begin with an investigation of the various definitions of the Information Age, then move into a discussion of the historical & technological foundations of information production, computing devices, and communication and networking tools. We will explore the social and cultural history of information production and consumption from cave paintings to the Internet, from analog computational machines to handheld computers. The course will generally be based in the history of the US, but, given the transfer of technology and the increasing ability of these technologies to transcend geographic regions, it will logically range more widely as appropriate. This course will help students build upon a range of skills, including the ability to make discipline-specific oral presentations to groups; the ability to utilize technological resources in research, data analysis, and presentation; the ability to communicate in a group setting; and the ability to read critically primary sources and modern authorities. This course also counts in the History Major and the Digital Studies Minor. As part of the Honors Program, this course also will help students to formulate an academic argument with appropriate research documentation; articulate the value of the goals of the honors program as it relates to the liberal arts as an multidisciplinary, systematic approach to knowledge; apply specific academic solutions to broader, interdisciplinary fields of study; integrate multiple viewpoints involving different cultures and/or perspectives. Non-negotiable parts include: Students are expected to attend all classes, read all assigned texts, post regularly to the individual blogs, participate in class, and help lead two weeks of class discussions. Students are also expected to contribute to the creation of a public, digital timeline/database of popular representations of the information age and add materials to it all semester. However, negotiable is whether or not we should also do formal presentations of projects, what student contributions to the timeline/database might be, even other ideas for assignments we might come up with. Obligatory turn things in on time notice: Projects are due at the start of class on the day they are due. Projects are considered late if turned in anytime after the start of class on the day they are due. Late items will be penalized one full letter grade or, after 24 hours, not accepted. Downey, Gregory John, American Historical Association, and Society for the History of Technology. Technology and Communication in American History. Washington, DC: American Historical Association, 2011. Gleick, James. The Information: A History, a Theory, a Flood. New York: Pantheon, 2011. Rosenzweig, Roy. Clio Wired: The Future of the Past in the Digital Age. New York: Columbia University Press, 2011. Winston, Brian. Media Technology and Society: A History From the Telegraph to the Internet. Re-issue. London: Routledge, 1998. Students are expected to attend all classes having read the material. Class participation includes actively participating in these daily discussions. Each of you will also be expected to co-lead group discussion with another person (or persons) during two weeks, including opening discussion activities. THAT MAY MEAN HELPING TO CHOOSE (ADDITIONAL) READINGS FOR THOSE WEEKS. I encourage those leaders to meet with me ahead of time to talk about how to choose readings and/or facilitate discussion for their particular week. Create a new (or use a preexisting) UMWblog/Domain of One’s Own WordPress site by Sept. 1. Narrating your reactions to the reading, your experiences planning, researching, and implementing your projects as part of the class timeline/database via your blogs is a central part of the class and a way for me to measure your effort, your creativity, and your progress as digital scholars. Blog about your problems as well as your successes. Be sure to comment on each other’s blogs and help each other out. This is a community of people going through similar efforts that you can tap into, so do so. Weekly posts & comments are a minimum expectation of the class. Final grades will be determined based on a combination of factors, some determined by me and some determined by the class as a whole at the start of the semester. The non-negotiable parts are class participation (including two weeks of co-leading discussion) worth 40% and on performance on blog posts worth (at least) 10%. The other 50% of the grade will be divided (as decided by the class) between projects added to the timeline, formal presentations of projects, or other items as suggested by the class. The Office of Disability Resources has been designated by the University as the primary office to guide, counsel, and assist students with disabilities. If you receive services through the Office of Disability Resources and require accommodations for this class, make an appointment with me as soon as possible to discuss your approved accommodation needs. Bring your accommodation letter with you to the appointment. I will hold any information you share with me in strictest confidence unless you give me permission to do otherwise. If you have not made contact with the Office of Disability Resources (540-654-1266) and need accommodations, I will be happy to refer you. The office will require appropriate documentation of disability. Contact Downing Newcastle for more information. I believe in the Honor Code as an essential, positive component of the Mary Washington experience. You should know that if you cheat or plagiarize in this class, you will fail, and I will take you to the Honor Council, so do not do it. On the other hand, I also believe that having friends or family read and comment on your writing can be extremely helpful and falls within the bounds of the Honor Code (assuming the writing itself remains yours). If you have questions about these issues, then you should talk to me sooner rather than later. — What is the Information Age? — Planning the semester – What topics will we focus on? What assignments will we complete? — Set up a Twitter account (or use an existing one) and follow me (@jmcclurken) and/or your classmates and/or some of the scholars from the DH Compendium. When you tweet about our class use the hashtag #InfoAge14. — Install a WordPress blog on your Domain of One’s Own account or UMWblogs. — Write and publish first blog post on why you’re taking the class and what topics/assignments you want this semester. Exam Period – Discussion of the semester – what worked and what didn’t. Braunstein, Alex, and Tony Lincoln. “History of Information » Syllabus”, HIST C192, http://blogs.ischool.berkeley.edu/i103su10/course-information/syllabus/. Ensmenger, Nathan. “The Information Age”, University of Pennsylvania, http://www.sas.upenn.edu/~nathanen/files/STSC160syllabus-2009.pdf. Watrall, Ethan. “History of the Digital Age.” Syllabus, 2010, http://history.msu.edu/hst250-online/schedule/. 1) Which topics are you particularly interested in studying this semester? 3) The central work of the class for the semester will be the creation of a digital timeline/database of popular representations of the Information Age and add materials to it all semester. We’ll generate the list of dates/items together and then you’ll be creating additional pieces (either as individuals or in groups) that will be added to the timeline database. So, what types of assignments/projects would you be interested in working on/doing? What alternative ways might we use to construct/present what we’ve learned in and out of the class about the history of information? I want to take advantage of the digital media resources on campus. In particular, there are two resource-rich locations we should be thinking about. i. The Digital Media Lab in the History/American Studies department in Monroe. We’ll have 3 iMacs and two Windows computer, with scanners, digital cameras, as well as basic and advanced image, video, and audio editing software. What kinds of projects could we do with those tools? What percentage of course grade should those assignments be valued at? 4) I want to take advantage of the classroom we’ll be in. 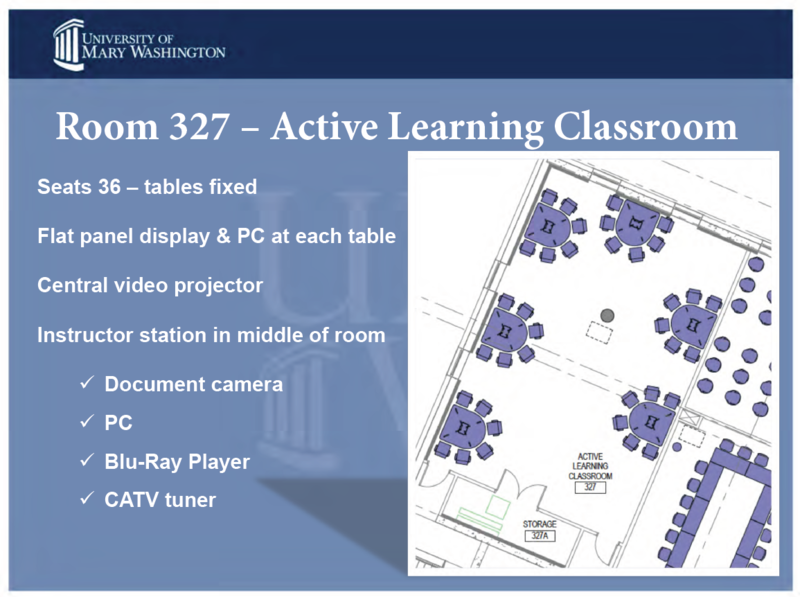 The new active-learning classroom in the ITCC that we will be in is built around the idea of group work. In addition to the standard projector and screen, it will have LCD panels at small group tables around the room so students will be able to hook up their laptops and work collaboratively. I’ve been thinking about having some discussion days start by splitting up into groups with a small topic assignment, giving you 15-45 minutes to work in groups, then asking you to present your results to the rest of the class. What classroom small group projects would you like to try? 5) What do you think of the layout of the course schedule? Do you want to spend more or less time on certain broad topics? To that end, for each class students should also prepare some notes on the reading (parallels, problems, factual questions, reminders of past readings, connections to ideas from other classes or from “real life”) so that they have those points in front of them for the discussion. Although I have no current plan to collect these comments, I reserve the right to do so at some point during the semester. And, frankly, the department reception is even better. It’s low key, everyone’s happy, even relaxed. I really enjoy talking to the parents and students. It’s a chance to brag about our great students to an audience who is thrilled to hear about it. This year, though, I had three conversations that I’ve never had before. First, I talked with two parents that I had met four years ago on the day they first brought their son to school. We had a wonderful conversation about history, about the liberal arts, about their son’s academic interests, and about my own research (which overlapped with his own interests). He wasn’t part of that initial conversation four years ago, but his younger sister was. Instead, his parents told him about the conversation and he contacted me about getting in to my First-Year Seminar on returning American veterans throughout history, which we were able to do. Since then, he took another class of mine and just completed his senior thesis with me on the relationship between Grant and Meade during the Overland Campaign. [Plus his sister ended up coming to UMW and taking my women’s history course last fall.] So, the conversation I had at the senior reception with their parents brought us all back full circle. We had the chance to talk on the first day they left their son at UMW and on the last day before his graduation. There was an arc to that relationship that felt so right for all of us. Frankly, I wish there were more of these stories of having four years to know students and their parents, to follow the arc of a student’s career in a way that doesn’t happen often enough. I wonder if there are ways we might engineer more of these longer connections. The second conversation was with parents who I’d never met before, but my mother had. Earlier this semester, my mother, an elementary school teacher in Albemarle County, and I realized that I was teaching a student that she had taught in Kindergarten. So, at the senior reception, I had the chance to meet this student’s parents and we had a wonderful conversation about the arc of that story as well. As the student said when she first found out, “That’s amazing! My education begins and ends with McClurkens!” It was a lovely reminder that we get students who are products of 13 years of contact with earlier teachers, of the many ways that those previous experiences affect them, and of the ways that parents remember those teachers too, sometimes more clearly than the students do. The third conversation was with a student who was graduating just two years after he graduated high school. I met him at a banquet for prospective students 6 months before he started at UMW and have been his adviser for two years. Not surprisingly, a student who manages to finish a college degree in two years (with one of those semesters spent abroad) doesn’t need much advising, but it has been a pleasure to work with him and to meet his family. Even in those two years he has grown immensely as a scholar and a person, something I was able to see as he was incredibly successful in a class with me this semester. Meeting his family I could talk about that transformation and how glad I was to be some small part of his experience at UMW. All three of these conversations at the receptions were good reminders that strong connections with students can (and maybe should) begin before they start here, of the role that parents can play in supporting their students, and of the many longer arcs of relationships that exist in our worlds that seem to be typically defined by the year or even semester. tl;dr version: Jeff got a new job. As of May, I will have been chair of the Department of History and American Studies for six years. In that time, I’ve published a monograph, been promoted to full professor, published several articles/essays, presented at over 40 conferences and workshops, was a part of the team of professional term paper writers and served on countless committees and review boards on and off campus. But I am particularly proud of my department over the same time: over 1/3 of my colleagues have been awarded tenure, they have published 5 books (and counting), 35+ scholarly articles & book chapters, & 30 reviews/short essays served on 45 professional organization committees, including as book series editors/members of editorial boards, as conference program or book prize reviewers, & as officers (including two presidents) of professional organizations, they have presented at hundreds of conferences, and served as at least as many committee years. We have established a program that has a two-semester methods class and integrates concepts of digital identity and digital fluency more deeply than any other history and American Studies program I have seen. We have created 45+ new courses in that time and we contribute to 12 majors and minors, including new programs in Women’s & Gender Studies, Museum Studies, Urban Studies, Social Justice and Digital Studies. I don’t pretend that my tenure as chair resulted in this amazing productivity of these teacher-scholars, but I do know that I’ve worked as chair to help support and serve them in that mission and I’m proud to call them colleagues. I am also incredibly proud of our students. We have an amazing set of History and American Studies students with a track record of creating rich digital projects, a decades-long streak of student winners of the campus writing contest, Phi Beta Kappa membership, earning departmental honors, publishing senior theses, and of students going on to graduate school (70% do within 5-10 years) and finding terrific professional positions. Perhaps more importantly, they are thoughtful, smart, engaged people, many of whom are already making contributions to their chosen fields. All of this is to say that I’m in an awesome department, one that I’ve been honored to serve as the chair of for the last six years. But it’s also time to move on, if not from the department, then from my chairing of it. If you read my blog or follow me on Facebook or Twitter, then you know that I’ve been particularly passionate about the intersection of teaching and technology for over a decade. I’ve been offered an opportunity to follow that passion and at the school that I continue to cherish. As of May, I will step down as department chair and begin my new job as UMW’s Special Assistant to the Provost for Teaching, Technology, and Innovation. This new position is a half-time teaching position, so I will still get to work with students in my classes each semester. But the rest of my time will be focused on the ways that technology, teaching, and research intersect and lead to innovation at UMW and beyond. Specifically, I will be working with the directors of UMW’s terrific Center for Teaching Excellence and Innovation (Mary Kayler) and the Division of Teaching and Learning Technologies (Jim Groom). [A privilege since both have been making me and many other UMW faculty look cutting-edge for years.] I’ll also be collaborating with IT, Speaking Center, Writing Center, Library, Events, and Student Affairs to get the new Information Technology Convergence Center up and running. Seek out grant and development opportunities for UMW and its partners in these areas. I am incredibly excited to take on this new position and to be able to build on the excellent work that Mary Washington’s faculty, students, and staff have already done in this area. Look for more here in the weeks and months to come about the process, potential, and progress in this new position for me. *In some ways, I’ll also be expected to talk even more about the work that is happening at UMW and elsewhere in the field of the digital liberal arts and digitally enhanced pedagogy. So, I plan on taking up my writing for ProfHacker again (that’s a public commitment Jason and George….) and look for more posts here as well. I also see my service on the new THATCamp Council as fitting in with my new expanded role here at UMW.